Tonight and tomorrow, the Baseball Writers Association of America will be able to announce the winners of the two most prestigious post-season awards, and the Cardinals are well represented in both categories. Though Adam Wainwright is not expected to win the Cy Young Award (Clayton Kershaw seems to have it all but locked up), the battle for MVP is developing into quite the hot topic. Most “experts” seem to believe Pittsburgh’s Andrew McCutchen, who led his team to its first winning season in over 20 years, will land at the top of the ballots. An award that generally follows the path the numbers create favors the center fielder whose .317 average in 583 at bats, complete with 97 runs, 21 homers, 84 RBI, 27 stolen bases, an 8.2 WAR (not to mention his fielding percentage, runs saved, etc.) — especially as a center fielder — make him an easy favorite. Now, I know my perspective is dripping in bias, but I don’t think it has to be in order to make a convincing argument in favor of Yadier Molina. It does, though, require a willingness to look beyond just the numbers to what “value” really means. Like it or not, it isn’t possible to measure value solely by the numbers. It’s harder to defend outside of statistical analysis, sure. But that doesn’t change the level of ambiguity “value” implies. Numbers are a good starting point, though, so let’s go there first. 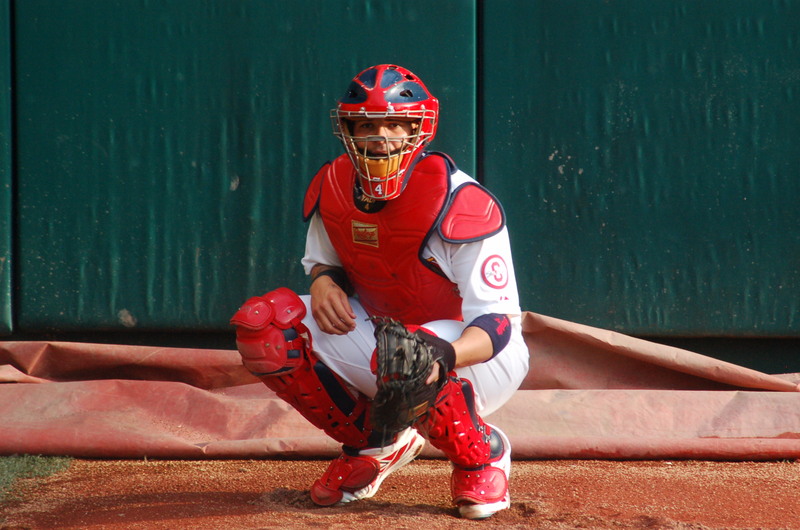 On the year, Molina was a clear standout offensively among catchers in the National League. His .319 average led the NL, as did his 161 hits, 56 extra base hits (including 44 doubles), 241 total bases, 68 runs scored. His .836 OPS was just shy of Chicago’s Dioner Navarro for second best, an his 80 RBI trailed only Jonathan Lucroy’s 82. Despite a stint on the 15-day DL for a knee injury, he was still third in the NL (among catchers) in games played (136) and total at bats (505). Those numbers were good enough for a Silver Slugger Award — the first of his career. And he’s not even known as an offensive catcher! So then there’s the defense. In his NL leading 1115.1 innings caught (again, despite the DL stint and continuing knee problems) in 128 starts, he was second in double plays (11), caught 43.5% of all attempted basestealers, and led the league (at his position) with 12 defensive runs saved. Molina — the fifth player in Cardinals history to win (at least) six straight Gold Glove Awards — never leaves a doubt when it comes to defense. But what about everything else he does? The things that truly make him most valuable? What about the times he went to the mound to calm down one of the 13 rookie pitchers he caught this season? Those “discussions” may have been one-sided, but there were undoubtedly more effective than anything Mike Matheny could have said. “Just stop thinking and throw what I tell you, where I tell you,” I imagine he said, in one form or another. It worked with Carlos Martinez, who turned into an electric late-inning guy during the postseason. It worked with Michael Wacha who, well, we all know what kind of magic he created. Molina kept Shelby Miller in check. He talked Trevor Rosenthal into a normal breathing pattern with the season on the line. He made 22 and 23 year olds look like grizzled veterans. Never flinching. Never backing away. Who can forget the look he gave Wacha after he struggled in Game Six of the World Series? He wouldn’t let the Wacha off the mound without reassuring him that he’d done a great job. The trust between Molina and his pitchers is undeniable. To a man, every pitcher asked this season credited Yadi for his game calling and the confidence it established. The staff learned quickly — it only takes once! — that you don’t shake off Molina. Yadi knows best. He’s a field manager, directing defensive positioning, and always watching, ready to make any adjustments necessary. Yadier Molina’s teammates think he’s the best catcher in the league, but it’s not only for his numerical production. He’s the leader. He’s what makes his team tick. Without him, they played at two games under .500. With him, they rolled along at 34 games over. No, he doesn’t have the story behind him like Cutch does. He doesn’t have the stolen bases or the home runs that Paul Goldschmidt has. But, there’s no doubt in my mind that the Cardinals succeeded because Molina made them better in every phase of the game. To me, that makes him the most valuable. This entry was posted in 2013 Season, MLB and tagged Adam Wainwright, Andrew McCutchen, BWAA Awards, Carlos Martinez, Clayton Kershaw, Cy Young, Michael Wacha, Mike Matheny, MLB, MVP, Paul Goldschmidt, St. Louis Cardinals, Trevor Rosenthal, Yadi for MVP, Yadier Molina by Tara Wellman. Bookmark the permalink. What you said best exemplifies what the MVP is supposed to be. He isn’t the best player in the league, he’s the most valuable. As good a job as Tony Cruz did, this teas would have been nothing if not for Yadi. Reblogged this on Kuruko Darkwolf.